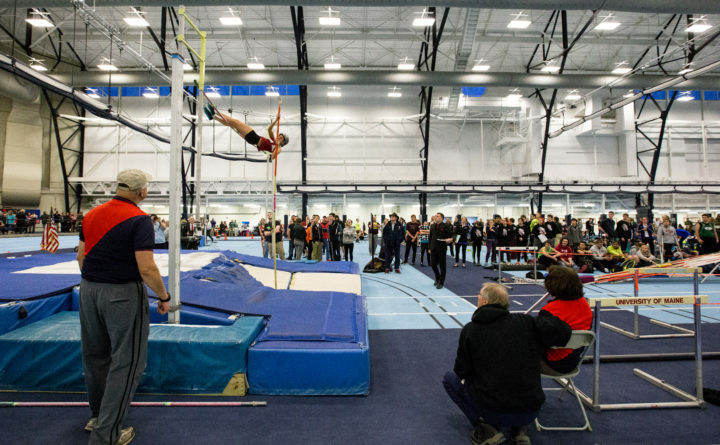 The PVC/EMITL championships were held at the University of Maine in Orono on Saturday. 4×800 Meter Relay: 1, Hampden ‘A’ (Glowa, Connor, Harriman, Parker, Allen, Trevor, Valentine, Abbott), 8:47.66. 2, Hermon ‘A’ (Stevens, Braedon, Zapsky, Ben, Fowler, Dylan, Pottle, Max), 8:50.44. 3, Brewer ‘A’ (Luce, Nick, Giggey, Zeb, Stroup, Sam, Geiser, Logan), 9:02.33. 4, Bangor ‘A’ (Knightly, Dwight, Wellman, Zack, Sewell, Isaac, Doore, Gordon), 9:12.45. 5, Old Town ‘A’ (Letourneau, Nicholas, Francis, Benjamin, Smith, Gage, Pelletier, Matthew), 9:42.84. 55 Meter Hurdles: 1, Beaton, Zachary, Hermon, 8.14. 2, O’Kendley, Conor, Hampden, 8.92. 3, Blackwell, Peter, Bangor, 9.35. 4, Rush, Adam, Hermon, 9.36. 5, Nadeau, John, John Bapst, 10.04. 55 Meter Dash: 1, Francis, Landyn, Bangor, 6.74. 2, Stewart, Tristan, Bangor, 6.84. 3, Dorr, Wayne, Old Town, 6.85. 4, Munroe, Andrew, Bangor, 6.88. 5, Fostun, Zachariah, Old Town, 6.91. 6, Sokoloski, Ethan, Hampden, 7.21. 1 Mile Run: 1, Lord, Wyatt, Hampden, 4:32.27. 2, Mathies, Jason, Hampden, 4:32.72. 3, Gonczy, Daniel, Brewer, 4:38.69. 4, Sokoloski, Grahme, Hampden, 4:44.51. 5, Byram, Kyle, Hermon, 4:46.37. 6, Doore, Gordon, Bangor, 4:48.26. 400 Meter Dash: 1, Francis, Landyn, Bangor, 53.45. 2, Stewart, Tristan, Bangor, 53.81. 3, Frye, Stu, Hampden, 54.07. 4, Allen, Ben, Hampden, 56.45. 5, Letourneau, Nicholas, Old Town, 56.90. 6, Crenshaw, Dante, Old Town, 57.24. 800 Meter Run: 1, Lord, Wyatt, Hampden, 2:04.70. 2, Mathies, Jason, Hampden, 2:04.94. 3, Sokoloski, Grahme, Hampden, 2:07.48. 4, Geiser, Logan, Brewer, 2:08.75. 5, Stevens, Braedon, Hermon, 2:09.52. 6, Valentine, Abbott, Hampden, 2:12.25. 200 Meter Dash: 1, Munroe, Andrew, Bangor, 23.52. 2, Francis, Landyn, Bangor, 23.71. 3, Stewart, Tristan, Bangor, 24.03. 4, Dorr, Wayne, Old Town, 24.37. 5, Bruen, Chris, Hampden, 24.41. 6, Smith, Devin, Hermon, 24.88. 2 Mile Run: 1, Mathies, Jason, Hampden, 10:03.88. 2, Lord, Wyatt, Hampden, 10:11.50. 3, Knightly, Dwight, Bangor, 10:14.65. 4, Glowa, Connor, Hampden, 10:16.23. 5, Meserve, Ian, Hermon, 10:21.88. 6, Valentine, Abbott, Hampden, 10:34.85. 4×200 Meter Relay: 1, Old Town ‘A’ (Dorr, Wayne, Veilleux, Elijah, Letourneau, Nicholas, Fostun, Zachariah), 1:36.51. 2, Hampden ‘A’ (Frye, Stu, Dunning, Jack, Sanchez, Alex, Bruen, Chris), 1:39.69. 3, Hermon ‘A’ (Smith, Devin, Shaw, Owen, Pottle, Max, Staples, Evan), 1:39.98. 4, Bangor ‘A’ (Larrabee, Kyle, Dionne, Paxton, Rand, Josh, Jordan, Cole), 1:41.19. 5, Mount Desert Island HS ‘A’ (Denning, Elijah, Freudig, Ben, Howell, Ieuan, Keblinsky, Sam), 1:41.66. 6, Brewer ‘A’ (Hunter, Zander, Bell, Connor, Hughes, Logan, Hart, Joshua), 1:42.21. Pole Vault: 1, Blackwell, Peter, Bangor, 12-00. 2, Hart, Joshua, Brewer, 11-06. 3, Denning, Elijah, MDI, J11-06. 4, Brown, Nicholas, John Bapst, J11-06. 5, Hayden, Mike, Brewer, 10-06. 6, Freudig, Ben, MDI, J10-06. High Jump: 1, Beaton, Zachary, Hermon, 6-00. 2, Jordan, Cole, Bangor, 5-10. 3, Allen, Ben, Hampden, J5-10. 4, Reid, Deandre, MDI, J5-10. 5, Regan, Nathan, Old Town, 5-04. 6, Sullivan, Nicholas, Old Town, 5-02. Shot Put: 1, Brown, Ryker, Bangor, 49-11.50. 2, Isaacs, Gilbert, MDI, 47-10.50. 3, Neal, Sean, Brewer, 46-02. 4, Greenlaw, Damyan, Brewer, 44-11. 5, Hill, Archer, MDI, 41-05.50. 6, Patten, Connor, Hermon, 39-06.50. Long Jump: 1, Fostun, Zachariah, Old Town, 19-08.75. 2, Hughes, Logan, Brewer, 19-04.75. 3, Veilleux, Elijah, Old Town, 19-04.50. 4, Dunning, Jack, Hampden, 19-02.25. 5, Brown, Wade, Hampden, 18-10. 6, Rand, Josh, Bangor, 17-09.25. Triple Jump: 1, Brown, Wade, Hampden, 42-00.75. 2, Veilleux, Elijah, Old Town, 41-03. 3, Hughes, Logan, Brewer, 39-06.25. 4, Regan, Nathan, Old Town, 39-04. 5, Dunning, Jack, Hampden, 38-06. 6, Dove, Isaiah, Hampden, 37-08.50. 4×800 Meter Relay: 1, Mount Desert Island HS ‘A’ (Munger, Grace, Osborne, Katelyn, Johnson, Olivia, Olson, Zoe), 10:31.10. 2, Hampden ‘A’ (Verhar, Amelia, Tash, Hannah, Bracciodieta, Grace, Parker, Eliza), 10:32.72. 3, John Bapst Memorial HS ‘A’ (Coltart, Aliah, Angelo, Isabelle, Brooks, Leah, Sidaway, Jaymie), 10:53.86. 4, Bangor ‘A’ (MacDonald, Anna, King, Ashley, Knapp, Jasmine, Gilmore, Lydia), 11:01.37. 5, Hermon ‘A’ (Bateman, Anna, Taylor, Jillian, Zapsky, Abby, Dorman, Lydia), 11:39.27. 6, Old Town ‘A’ (Talcove, Ashley, Austin, MacKenzie, O’Meara, Mallie, O’Meara, Audree), 11:53.10. 55 Meter Hurdles: 1, Honey, Morgan, Brewer, 8.83. 2, La Grange, Georgina, John Bapst, 9.03. 3, Hopkins, Hannah, Brewer, 9.10. 4, Gibbs, Madison, Brewer, 9.85. 5, Wittmann, Sofia, Bangor, 9.96. 6, Miller, Kim, Bangor, 15.06. 55 Meter Dash: 1, Noack, Naomi, Bangor, 7.80. 2, Lyons, Abby, Hampden, 7.93. 3, Stroup, Abby, Brewer, 7.98. 4, Rodick, Grace, MDI, 7.99. 5, Sharp, Marah, John Bapst, 8.08. Dowling, Ava, Hampden, 5:33.83. 4, Flanagan, Moxie, Hampden, 5:34.96. 5, Sidaway, Jaymie, John Bapst, 5:46.34. 6, Bateman, Anna, Hermon, 5:51.33. 400 Meter Dash: 1, Lambert, Mackenzie, Bangor, 1:02.10. 2, Parker, Eliza, Hampden, 1:02.48. 3, Gilmore, Lydia, Bangor, 1:04.54. 4, La Grange, Georgina, John Bapst, 1:05.21. 5, Angelo, Isabelle, John Bapst, 1:05.92. 6, Damboise, Emma, Hampden, 1:07.49. 800 Meter Run: 1, Olson, Zoe, MDI, 2:22.72. 2, Shearer, Helen, Hampden, 2:23.62. 3, Parker, Eliza, Hampden, 2:28.71. 4, Flanagan, Moxie, Hampden, 2:28.74. 5, Bracciodieta, Grace, Hampden, 2:33.75. 6, Hersey, Mickey, Brewer, 2:33.82. 200 Meter Dash: 1, Honey, Morgan, Brewer, 27.46. 2, Sawyer, Marilyn, MDI, 27.86. 3, Lambert, Mackenzie, Bangor, 27.93. 4, La Grange, Georgina, John Bapst, 28.05. 5, Elliott, Alyssa, Bangor, 28.16. 6, Dionne, Sophie, Bangor, 29.01. 2 Mile Run: 1, Shearer, Helen, Hampden, 11:26.07. 2, Gilmore, Lydia, Bangor, 11:52.20. 3, Mosca, Olivia, Brewer, 12:15.06. 4, Sidaway, Jaymie, John Bapst, 12:30.64. 5, Bateman, Anna, Hermon, 12:42.09. 6, Dowling, Ava, Hampden, 12:58.67. 4×200 Meter Relay: 1, Hampden ‘A’ (Verhar, Amelia, Lyons, Abby, Damboise, Emma, March, Chloe), 1:56.32. 2, Mount Desert Island HS ‘A’ (Rodick, Grace, Olson, Zoe, Freudig, Emma, Sawyer, Marilyn), 1:58.20. 3, Brewer ‘A’ (Pine, Sydney, Snowman, Madasin, Gibbs, Madison, Inman, Sophie), 2:00.54. 4, Old Town ‘A’ (Austin, MacKenzie, King, Madison, Redding, Madyson, Sanborn, Gracie), 2:00.58. 5, Bangor ‘A’ (Caron, Meaghan, Miller, Kim, Dionne, Sophie, Noack, Naomi), 2:00.84. 6, Hermon ‘A’ (Jelks, Malaya, Sickles, Maddie, Davis, Emma, Morgan, Emily), 2:01.21. Pole Vault: 1, Wittmann, Sofia, Bangor, 10-00. 2, Helfen, Kaitlyn, Brewer, 9-06. 3, Gibbs, Madison, Brewer, 9-00. 4, Noack, Naomi, Bangor, J9-00. 5, Friel, Megan, Brewer, 8-06. 6, Doore, Georgia, Bangor, 8-00. High Jump: 1, Inman, Sophie, Brewer, 5-02. 2, Sanborn, Gracie, Old Town, J5-02. 3, Lambert, Mackenzie, Bangor, 5-00. 4, March, Chloe, Hampden, 4-08. 5, McDonald, Emily, Bangor, 4-06. 5, Hopkins, Hannah, Brewer, 4-06. Shot Put: 1, Hargreaves, Emma, Old Town, 37-03.50. 2, Lavoie, Camden, Bangor, 33-10. 3, Cook, Lily, MDI, 29-11.75. 4, Gordon, Arianna, Old Town, 29-01. 5, Slick, Olivia, Bangor, 29-00.25. 6, Sheehan, Sydney, Old Town, 28-11.50. Long Jump: 1, Elliott, Alyssa, Bangor, 17-01. 2, Lyons, Abby, Hampden, 16-00.50. 3, Guerrette, Taylor, Hampden, 15-00.25. 4, Sanborn, Gracie, Old Town, 14-09.75. 5, Reed, Caroline, John Bapst, 14-09. 6, Stroup, Abby, Brewer, 14-07.75. Triple Jump: 1, Elliott, Alyssa, Bangor, 37-07.25. 2, Honey, Morgan, Brewer, 35-02.25. 3, Hopkins, Hannah, Brewer, 33-09.25. 4, Wittmann, Sofia, Bangor, 31-08.75. 5, Guerrette, Taylor, Hampden, 30-11.25. 6, Harvey, Grace, Old Town, 30-10.50. 4×800 Meter Relay: 1, Central ‘A’ (Wright, Ian, Cormier, Joey, Raymond, Cody, Velgouse, Liam), 9:19.83. 2, Ellsworth ‘A’ (Carter, Bryce, Lacasse, Colby, Snow, Ben, Shea, Matt), 9:20.37. 3, Orono ‘A’ (Livengood, Gabe, Abedi, Ryan, McClellan, Kyle, Ewer, Eli), 9:20.73. 4, Bucksport ‘A’ (Smith, Anthoney, Hileman, Micah, Brannen, Matthew, Hileman, David), 10:52.97. 55 Meter Hurdles: 1, Scheff, Henry, Ellsworth, 8.62. 2, Dittmar, Niklas, Orono, 8.63. 3, Cormier, Joey, Central, 9.12. 4, Deeny, Beck, Ellsworth, 9.38. 5, Owen, Tommy, Orono, 9.98. 6, Coombs, Bryce, Sumner, 10.17. 55 Meter Dash: 1, Tolmasoff, Carter, Bucksport, 6.73. 2, Ellis, Trenton, Orono, 6.91. 3, Deeny, Atticus, Ellsworth, 7.02. 4, Williams, Javon, Ellsworth, 7.07. 5, Sandone, Jack, Ellsworth, 7.21. 6, Hayes, Zeke, Mattanawcook, 7.25. 1 Mile Run: 1, Shea, Matt, Ellsworth, 4:53.12. 2, Cormier, Nicholas, Ellsworth, 4:55.98. 3, Tyne, Patrick, Orono, 4:58.13. 4, Farrell, Liam, Orono, 4:59.89. 5, Velgouse, Liam, Central, 5:01.03. 6, Saucier, Thorin, Orono, 5:02.81. 400 Meter Dash: 1, Sawyer, Nathaniel, Bucksport, 53.42. 2, Griffin, Alfie, Central, 54.52. 3, Mason, Nate, Ellsworth, 54.92. 4, Miller, Jack, Central, 55.10. 5, Hamilton, Colby, Ellsworth, 56.04. 6, Smith, Josh, Central, 58.77. 800 Meter Run: 1, Bradshaw Thomas, Meredith, George Stevens, 2:08.91. 2, Velgouse, Liam, Central, 2:11.25. 3, Tyne, Patrick, Orono, 2:14.52. 4, Ewer, Eli, Orono, 2:16.48. 5, Carter, Logan, Sumner, 2:20.08. 6, Wheeler, Tommaso, Orono, 2:20.53. 200 Meter Dash: 1, Tolmasoff, Carter, Bucksport, 23.90. 2, Renwick, Ian, George Stevens, 24.22. 3, Ellis, Trenton, Orono, 24.48. 4, Williams, Javon, Ellsworth, 24.71. 5, Griffin, Alfie, Central, 24.73. 6, Sawyer, Nathaniel, Bucksport, 24.86. 2 Mile Run: 1, Cormier, Nicholas, Ellsworth, 10:56.61. 2, Shea, Matt, Ellsworth, 10:57.82. 3, Farrell, Liam, Orono, 10:59.47. 4, Saucier, Thorin, Orono, 11:08.21. 5, Carter, Bryce, Ellsworth, 11:20.29. 6, McClellan, Kyle, Orono, 11:27.18. 4×200 Meter Relay: 1, Orono ‘A’ (Ellis, Trenton, Dittmar, Niklas, Robertson, Henry, Tyne, Patrick), 1:38.83. 2, Central ‘A’ (Small, Zach, Smith, Josh, Miller, Jack, Cormier, Joey), 1:40.13. 3, Bucksport ‘A’ (Sawyer, Nathaniel, Stegner, Gabriel, Smith, Jade, Tolmasoff, Carter), 1:40.97. 4, George Stevens ‘A’ (Bradshaw Thomas, Meredith, Renwick, Ian, Lesco, Theo, Howell, Ian), 1:44.38. 5, Ellsworth ‘A’ (Bishoff, Bailey, Lynch, Aaron, Updike, Sam, Sandone, Jack), 1:47.82. Pole Vault: 1, Bard, Aaron, Bangor Chr, 11-00. 2, Dittmar, Niklas, Orono, 8-00. High Jump: 1, Scheff, Henry, Ellsworth, 6-00. 2, Mason, Nate, Ellsworth, 5-10. 3, Bard, Aaron, Bangor Chr, 5-08. 4, Blanchard, Hunter, Mattanawcook, 5-06. 5, Wright, Ian, Central, 5-04. 6, Crowley, Dylan, Sumner, 5-02. Shot Put: 1, Preble, Luke, Central, 43-00. 2, Dow, Brandon, Central, 36-09.50. 3, Shephard, Xander, Mattanawcook, 36-06. 4, Bean, Jacob, Central, 35-11.25. 5, Richmond, Caleb, Central, 35-08.50. 6, Grass, Logan, Ellsworth, 34-02.50. Long Jump: 1, Mason, Nate, Ellsworth, 19-10. 2, Renwick, Ian, George Stevens, 19-06.75. 3, Williams, Javon, Ellsworth, 19-01.50. 4, Hayes, Zeke, Mattanawcook, 18-06.25. 5, Deeny, Atticus, Ellsworth, 18-05.50. 6, Deeny, Beck, Ellsworth, 18-00. Triple Jump: 1, Deeny, Beck, Ellsworth, 38-09.25. 2, Deeny, Atticus, Ellsworth, 38-01.25. 3, Scheff, Henry, Ellsworth, 37-04.50. 4, Duffy, Diondre, Mattanawcook, 36-02.50. 5, Lesco, Theo, George Stevens, 35-04.50. 6, Culina, Ben, Orono, 35-03.25. 4×800 Meter Relay: 1, George Stevens ‘A’ (Zentz, Lannea, Williamson, Tess, Czuj, Josie , Gadsby, Gabriyah), 12:11.36. 2, Orono ‘A’ (Brewer, Megan, Pearsall, Riley, Swanson, Zoe, Batchelder, Hannah), 14:11.04. 3, Central ‘A’ (Cole, Sage, Call, Abby, Viani, Julia, Leathers, Madi), 15:09.14. 55 Meter Hurdles: 1, Broughton, Grace, George Stevens, 9.74. 2, Coutts, Maggie, Orono,9.91. 3, Philbrick, Javona, Central, 10.00. 4, Watkins, Victoria, Bucksport, 10.60. 5, McKechnie, Emma, Ellsworth, 10.81. 6, Gutow, Syra, George Stevens, 11.08. 55 Meter Dash: 1, Robshaw, Cymeria, Penquis, 7.31. 2, Stiles, Johanna, Bucksport, 7.90. 3, Bussey, Britney, Bucksport, 7.91. 4, Francis, Grace, Central, 8.00. 5, Flubacher, Tara, Sumner, 8.31. 6, Tripp, Mikayla, Bucksport, 8.34. 1 Mile Run: 1, Tyne, Eleanor, Orono, 6:00.56. 2, Morrison, Lauren, Mattanawcook, 6:08.63. 3, Czuj, Josie, George Stevens, 6:20.80. 4, Stockley, Usha, Mattanawcook, 6:40.12. 400 Meter Dash: 1, Kohtala, Camille, Orono, 1:01.34. 2, Viani, Jaeden, Central, 1:04.27. 3, Morrison, Addie, Bucksport, 1:07.89. 4, Zentz, Lannea, George Stevens, 1:09.16. 5, Carr, Bri, Mattanawcook, 1:09.95. 800 Meter Run: 1, Tyne, Eleanor, Orono, 2:38.03. 2, Morrison, Lauren, Mattanawcook, 2:42.30. 3, Gadsby, Gabriyah, George Stevens, 2:45.93. 4, Shea, Shelbey, Lee, 2:58.53. 200 Meter Dash: 1, Kohtala, Camille, Orono, 26.68. 2, Broughton, Grace, George Stevens, 27.90. 3, Viani, Jaeden, Central, 28.47. 4, Morrison, Addie, Bucksport, 29.04. 5, Bussey, Britney, Bucksport, 29.10. 6, Jakub, Susanna, George Stevens, 29.52. 4×200 Meter Relay: 1, George Stevens ‘A’ (Broughton, Grace, O’Hara, Elia, Jakub, Susanna, Zentz, Lannea), 1:56.21. 2, Bucksport ‘A’ (Morrison, Addie, Watkins, Victoria, Stiles, Johanna, Bussey, Britney), 1:56.26. 3, Central ‘A’ (Viani, Jaeden, Viani, Julia, Philbrick, Javona, Francis, Grace), 2:02.83. 4, Sumner Memorial ‘A’ (Beattie, Vea, Howard, Skye, Howard, Blue, Flubacher, Tara), 2:10.51. Pole Vault: 1, Coutts, Maggie, Orono, 8-00. 2, Tyne, Eleanor, Orono, 7-06. 3, Pearsall, Riley, Orono, 6-06. 3, Batchelder, Hannah, Orono, 6-06. High Jump: 1, McKechnie, Emma, Ellsworth, 4-10. 2, Williamson, Tess, George Stevens, 4-06. 3, Erickson, Emily, Bucksport, 4-04. 4, Manner Wheeldon, Ivy, George Stevens, 4-02. Shot Put: 1, Hallett, Tori, Central, 26-04.75. 2, Call, Abby, Central, 26-01.50. 3, Tripp, Mikayla, Bucksport, 24-07.50. 4, Howard, Blue, Sumner, 24-05.25. 5, Frost, Emma, Central, 23-11.50. 6, Smith, Elyssia, Mattanawcook, 22-08. Long Jump: 1, Kohtala, Camille, Orono, 19-04. 2, Robshaw, Cymeria, Penquis, 18-02.50. 3, Manner Wheeldon, Ivy, George Stevens, 14-07.75. 4, Philbrick, Javona, Central, 14-04. 5, Swanson, Zoe, Orono, 13-10. 6, Susanna, Jakub, George Stevens, 13-09.50. Triple Jump: 1, Robshaw, Cymeria, Penquis, 35-07.25. 2, Coutts, Maggie, Orono, 31-02.75. 3, Gutow, Syra, George Stevens, 30-11. 4, Swanson, Zoe, Orono, 30-08.50. 5, McKechnie, Emma, Ellsworth, 29-05.75. 6, Williamson, Tess, George Stevens, 28-04.50.